Art is a visual tool that immediately depicts a story, emotion and atmosphere. And selecting artworks you love for your home will determine the overall look and feel of your place – it will set the scene of your lifestyle and perhaps even entice nostalgia. 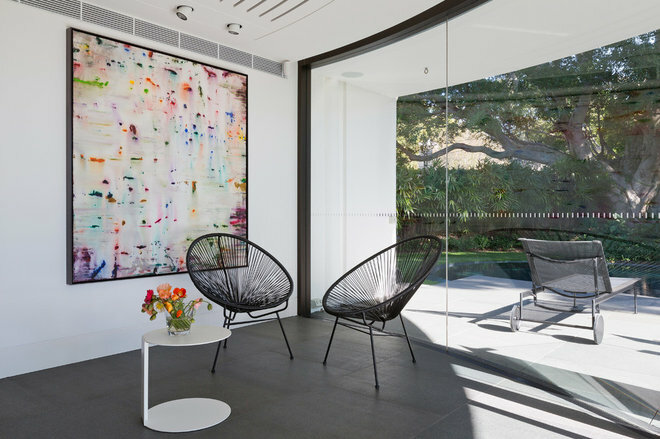 You can use a collection of art to your advantage, by displaying your taste and personality over a range of different art forms and having your guests discover your personal journey through a tour of your home. Not sure where to start? Use the following photos and tips as inspiration to buy your pieces and help them shine in every room of the house. Exposing yourself. Visit a range of art galleries, go to exhibitions and talk to art professionals. The first step in deciphering what type of art you like is by researching as much as you can. If you feel drawn to a certain period of art, keep exploring and learning from it. The more informed you are about periods and styles, the more you can be confident in what it is that you like. Adorning the bedroom. The art you choose for your bedroom should be something that really makes your heart sing. It’s the personal collection you will mainly see and enjoy, so its purely all about you! Think about the atmosphere you would like to create in your bedroom and search for artworks that will inspire that emotion. 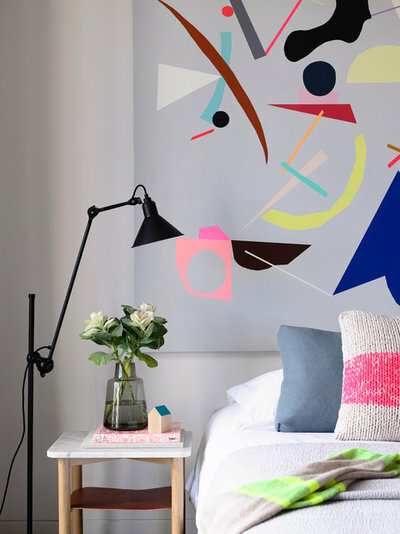 The large abstract painting in this interior uses a range of pastel colors and depicts a dream-like state which enhances creativity and relaxation in the bedroom. In the bathroom. Even the bathroom can feature art. 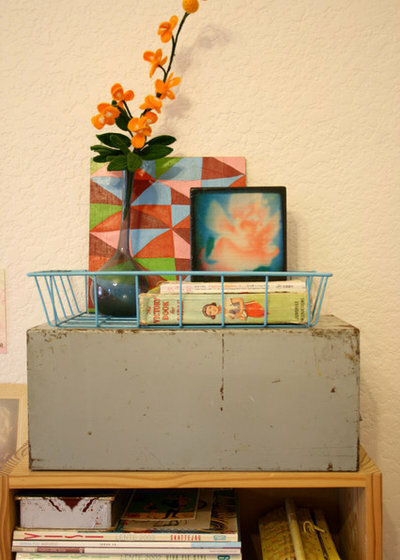 Definitely consider materiality and make sure the moisture from the bathroom won’t affect the type of art on display. Canvases work better in this space, rather than paper, and it’s wise to ensure your bathroom has good ventilation. 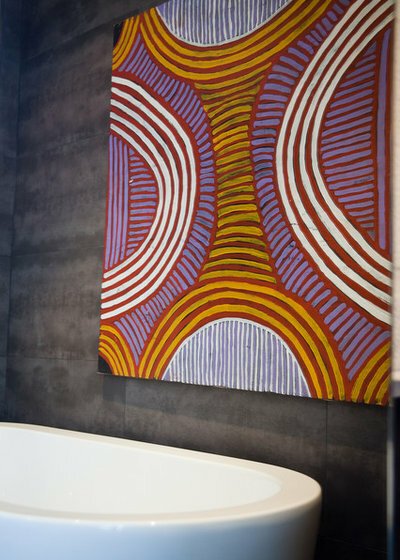 The Aboriginal artwork in this bathroom creates drama and raw appeal – its symmetrical yet abstract pattern leaves room for imagination. Porthole artworks. Why not display landscapes that will transport you into a place or scene that makes you happy? 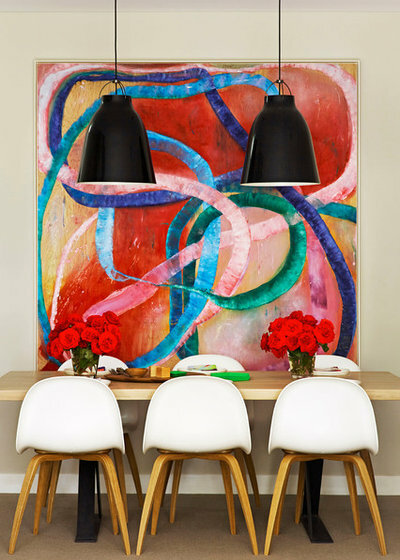 Look for large-scale pieces that will introduce the element of surprise and color into your interior. Notice how this beautiful scene creates a real depth within this living room – like you’re looking out of a window into paradise. The wow piece. If your going to break the bank on a piece, make it your statement artwork and situate it in a common area of your house so that it is viewed by the most people. Furnish the room so the artwork is the the center of attention. 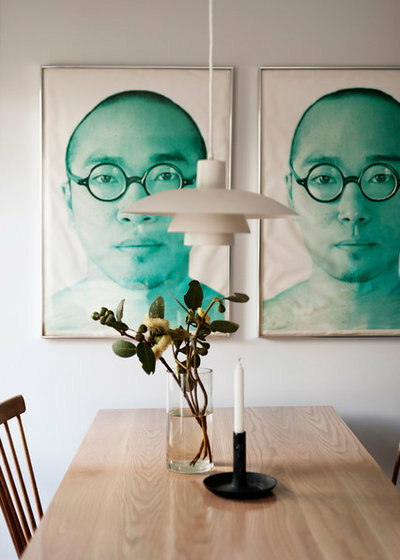 In this dining room Sydney interior design company Arent & Pyke has used a simple and soft color palette in the surrounding furnishings to let the statement artwork set the mood. Outside the frame. Sculptures bring life to a space because of their 3D characteristics, and the architecture of your home can really be enhanced by playing with shapes. The height in this interior has been maximized by the scattering of varying and tall artifact sculptures. 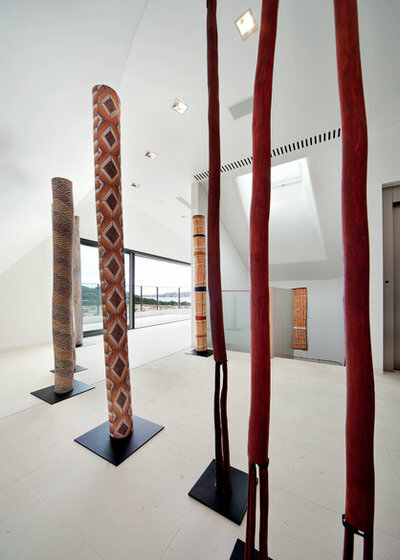 BONUS TIP: Indigenous art reflects the colors in the Australian landscape so why not use it to bring a nature-inspired color palette into your home? Mixing styles and mediums. 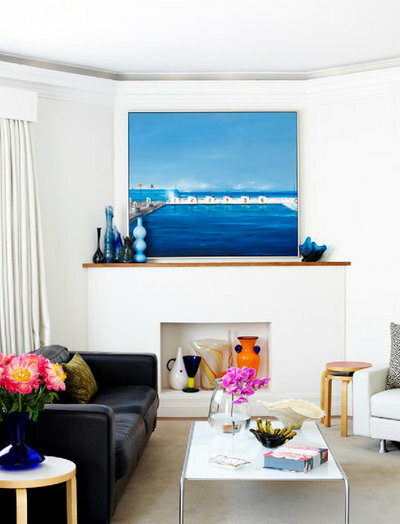 To create an eclectic scene and include smaller pieces of art, mix and match photographs, paintings and sculpture. These can range from inexpensive finds to slightly more pricey pieces. 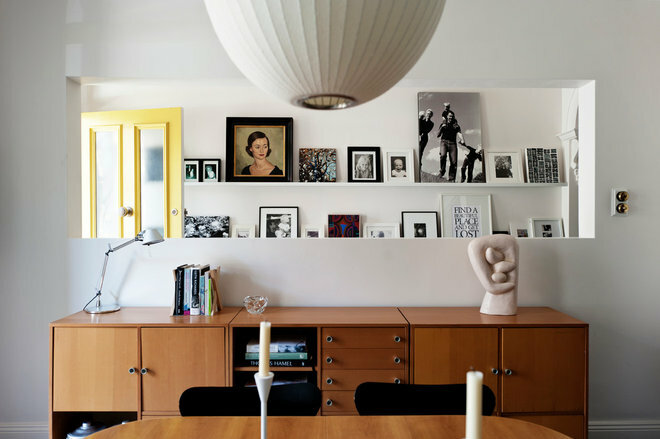 This is where your personality will shine as no-one else will ever put together a scene exactly the same as you will, so create little spaces to curate your own small collection. It will help your house really become a home. If you have a range of very different pieces you want to present, you can tie them together with color matching and contrasting. As you can see in this vignette, shades of baby blue are scattered throughout most pieces on display. A perfect picture wall. 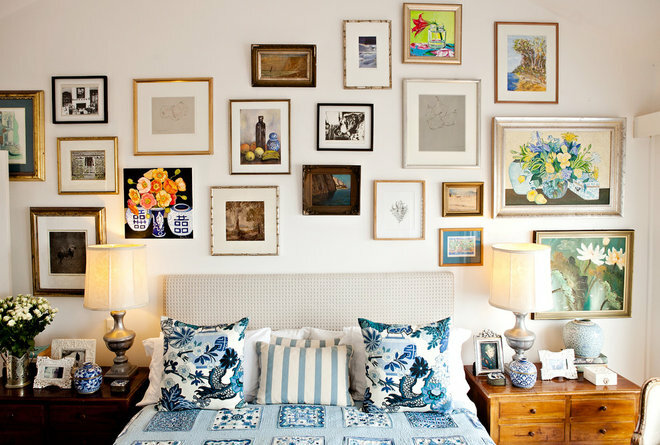 The best way to plan where to place different-sized frames on your wall is to make templates of each frame out of cardboard (remember to name or number each piece) and stick them up on your wall using Blu-Tack, moving them around until your happy with the configuration. Start with a centerpiece and step each frame around this piece. Keep in mind the proportion and balance for a successful final arrangement. Notice the surroundings. Consider the furnishings around the artwork and set a scene to complete the entire look you’re going for. The small artwork here works so well because of the mixture and heights of the plants and stool below. Without any furnishings, the artwork would look too small for the huge white space. Don’t forget to take into consideration what is actually depicted in the artwork itself. 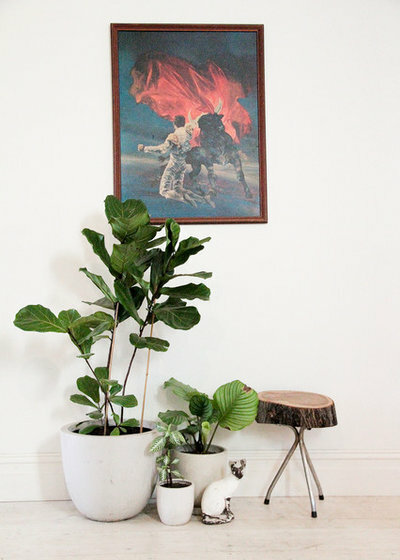 This is an action scene and the many directions of the leaves on the fiddle-leaf fig (far left) continue the trend of action and movement within the interior. Framing. Invest in quality customized framing for a fully considered design. The correct framing can improve an artwork whereas a poorly chosen frame can devalue an artwork. As you can see in this interior, the thin black frame perfectly complements the thin black lines of the two chairs.